"You're only as good as your last collection, which is an enormous pressure." Fashion month is nearing an end as press and style enthusiasts make a mad dash to see the last few remaining shows in Paris this week. Each collection -- from New York to Milan -- has exhibited its own individual charm, but there are a few elements that have been seen over and over again on the runways for fall 2014: furs, texture, knits, and shades of green. Georgina Chapman and Keren Craig for Marchesa are master designers when it comes to capturing femininity and their latest collection was no exception. Inspired by "billowing bonfires" and the Scottish Highlands, the dresses were full of romanticism, while adorned with lace and feathers and paired with pointed-toe flats. The two friends, who met at Chelsea College of Art and Design, also combined lace and fur in a genius way to create a soft and feminine sweater. They described their muse as "our Scottish woman who's a little bit more disheveled in winter, with this static hair like she's running through the fields in the Highlands." 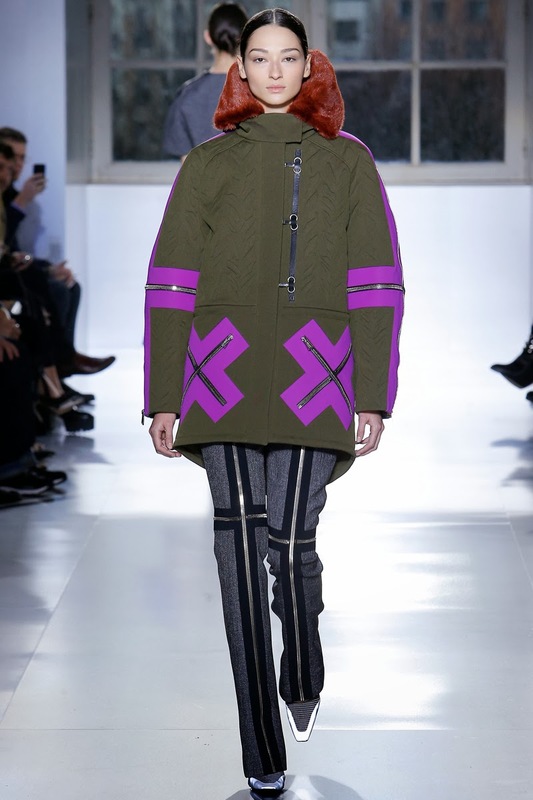 Creative Director Bill Gaytten for John Galliano created a collection inspired by Marc Newson's furniture designs. Printed velvet with a retro design, high-waisted pleated pants, and fur all came into play. The next time a passerby tells you that your dress reminds them of their grandmother's couch . . . well, you can thank Gaytten for that. After revealing his collection in Brooklyn, Alexander Wang headed to Paris for the Balenciaga show. "I go back to pieces that feel familiar—it's a sweater, it's a wrap dress, it's a raincoat—and ask myself, 'How do I make it feel special?'" he said. An expert when it comes to knits, Wang incorporated them into the collection and manipulated the fabric in a unique way, which led to inventive shapes and silhouettes. He also strategically placed eye-catching zippers on tops, coats, pants, and dresses and accessorized the models with luxurious carrier bags. "I love the idea that something as simple as a shopping bag can come in croc!” Wang explained. This week I experimented with creating a new sleeve pattern with a little extra volume. After I had perfected the sleeve, I incorporated it into a lined jacket made out of an Italian brocade. I paired it with high-waisted shorts that I made a few summers ago because I love the idea of shorts with a jacket for the transitional seasons. I also made a simple, yet custom-fitted, dress using an organic cotton twill in a military green that will perfectly coincide with the color for next fall. After this harsh winter, springtime and all the refreshing dresses that go with it cannot come soon enough!